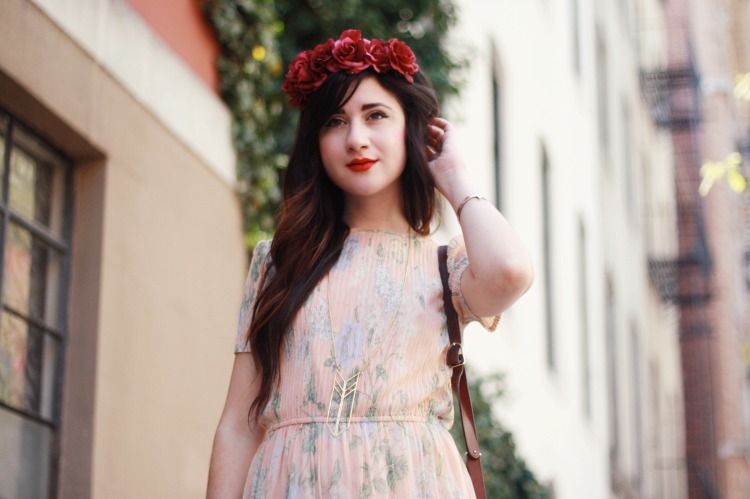 Couldn't be more obsessed with this spring-y dress from my favorite vintage shop, Grey Dog! Spent the day in it yesterday, twirling around and feeling free as can be. My allergies are terrible but I am so glad that the warm weather is here! Hope you all are having a lovely sunday! It's going to be a lazy one for me. lovely dress! It's so flowy. Looking beautiful! You always find the best vintage! Such a romantic and pretty outfit! and those flowers to your lips make this image very alluring..
your floral crown suits your hair colour so perfectly. and that dress is incredibly pretty! Grey Dog must be a lovely vintage shop. 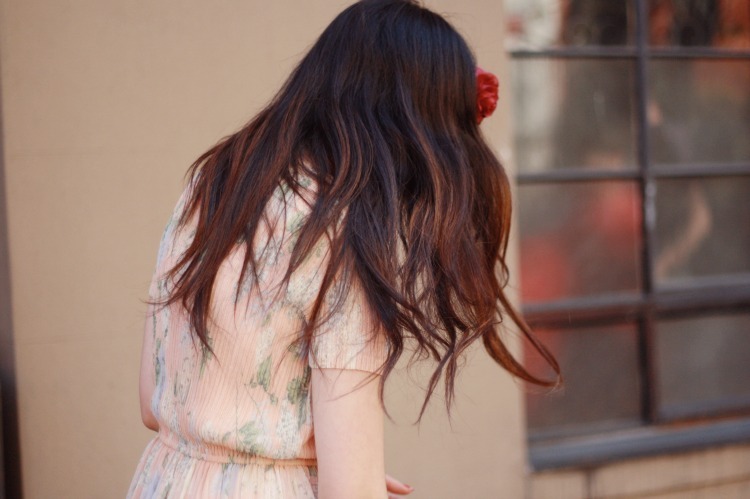 Your vintage Spring dress looks beautiful and wonderfully feminine. I love it! I can just imagine you twirling in it. I'm sure photos of that would be amazing. 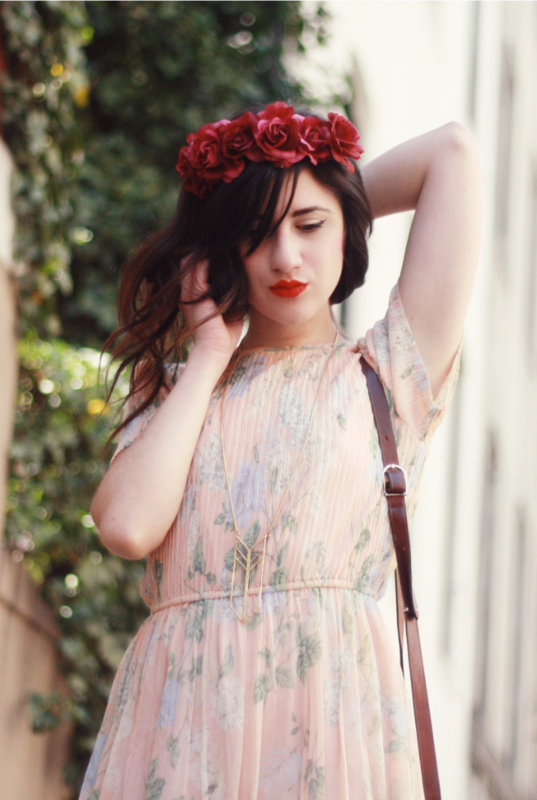 The highlights in your hair, your lipstick and your red rose floral crown are all beautiful. I have allergies too, but like you I'm so glad the warm weather is here. I find it hard to overstate how much I love Spring. I hope you are enjoying your lazy Sunday too. You look so pretty in that lovely dress. The flower headdress looks so fabulous! cute, i love your necklace! ahh love your flower headband! Such a romantic look :) I love it! I love the subtle pleats on your dress! Could you please give me that dress??? What a beautiful dress, especially the pattern and soft colours. Suits your immensely. This dress is so you! I love it, beautiful! Wow! You look so pretty. Love the dress. What brand/colour is this lipstick? !